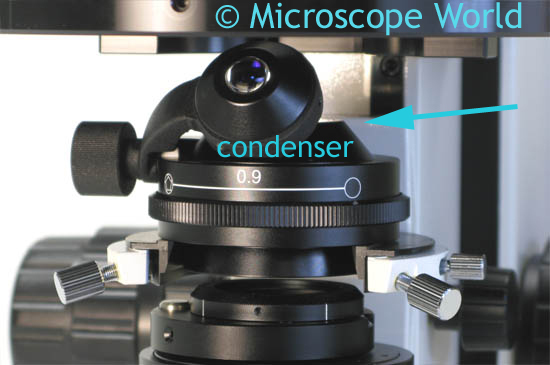 It is common for beginner microscope users to incorrectly adjust the condenser on their microscope. The condenser is located beneath the stage on a biological microscope or a polarizing microscope and controls the amount of light that passes from the illuminator, up through the stage and the specimen. The microscope condenser regulates the intensity of the light by closing or opening the condenser diaphragm or by adjusting the height of the condenser. Microscope condenser from a polarizing microscope. When using the microscope the light should not be adjusted using the condenser (this is a common mistake). Use the intensity control on the light to adjust brightness of the lamp. If you try to adjust the light coming through the microscope by closing the condenser diaphragm it diminishes the resolution of the microscope. Always open the diaphragm on the microscope condenser as wide as possible while still achieving a good image. To achieve sufficient contrast it should be closed just slightly - a good rule is to have the condenser open to at least 2/3 maximum capacity. Better results are almost always achieved by placing the condenser in the highest position.